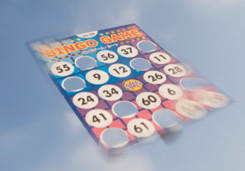 The British Bingo differs from the American Bingo not only in the quantity of balls in the game and how the tickets look like. One of the most curious features of the UK Bingo game played in the actual Bingo gambling rooms are the Bingo Calling Numbers rules. To understand the meaning of the Bingo Calling Numbers we shall start with the purpose. This is done to help gamers to understand the ball that is called and eliminate mishearings. The game is played in a custom way though with a slight difference in the Bingo Calling Numbers rules. The caller names the number in the traditional way and after that names the ball’s nickname that might hint on the fell out number. The lists of the most popularly used names in the Bingo Calling Numbers rules are all the time the same for biggest part of the land-based gambling halls, however, there can be small differences from one hall to the other. We are going to list the most traditional nicknames of the Bingo Calling Numbers rules and the origin of a few of them. 21. Key of the door and Royal salute Just my age, If only I was..
24. Two dozen, Did you score? As one can see, most of the balls according to the Bingo Calling Numbers rules are called this way to either rhyme or provide a clear idea of the ball being named. The custom of applying the names is saved to make the unique atmosphere of the Bingo rooms cause since the new technologies have been implemented, the Bingo game started losing the image. Now you know much about Bingo game and can try it at one of the premium casinos together with other popular casino games. Before you play for real money, learn the Bingo winning tips, casino blackjack rules, card counting blackjack strategy, Roulette Tips and learn to bet wisely!